Northern Ireland Under 21 international Bobby Burns. Hearts full-back Bobby Burns could be a few friends light if he ends the season clutching a Scottish Cup medal. The former Glenavon star started at Hampden Park on Saturday as he, and fellow Northern Ireland full-back Michael Smith, helped Hearts ease past Championship side Inverness Caledonian Thistle 3-0 to seal a spot in next month's decider. Celtic followed that path a day later, overcoming Aberdeen by the same scoreline at the same stadium to rubber-stamp their spot in the same end-of-season celebration. Well, it will only really be a party for one half of the historic stadium. Burns and his Hearts side are the one team that stand in the way of Neil Lennon's Celtic and an historic treble treble. Having won every domestic trophy available under Brendan Rodgers, including this season's League Cup, and the Scottish Premiership title almost mathematically certain, the Scottish Cup is the ninth piece of the nine-piece jigsaw to slot into place. And in that context, Burns is under no illusion that some of his friends will have somewhat mixed feelings on his bid for a first trophy. "There will be a few people from back home that won't talk to me if we win," he laughed. But there will certainly be no space for considering any strained relationships. The former St Malachy's Head Boy, perhaps showing modesty and definitely showing maturity, recognises that this could be his only chance to win such a prestigious competition. "You just think this could potentially be the biggest game of your life at just 19 and maybe the only trophy you ever et the chance to win. You just don't know," he said. Hearts fans would back that up. They're hoping for only their fourth Scottish Cup triumph since 1956. 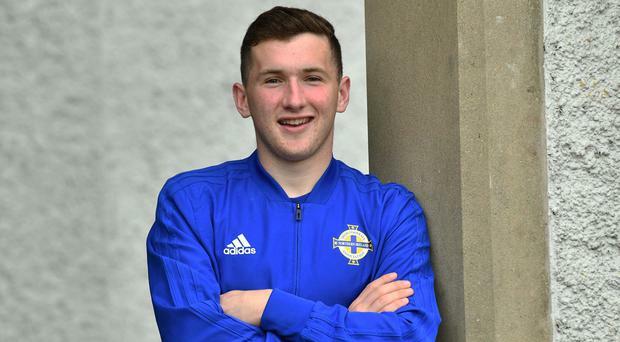 If he manages to get the nod for the big game, on May 25 at Hampden, it will mark the culmination of an astounding rise for 19-year-old Burns, who was still playing Irish League football one year ago. It will also be his first taste of cup final football, having not yet become a first team regular when Glenavon beat Linfield in the Irish Cup decider three years ago. "I was at that final but wasn't involved in the squad so I didn't get a suit or travel with the team," he recalls. "I remember that day watching on wondering if I would ever get an opportunity to play in an Irish Cup final and now a few years later I will hopefully get the opportunity to play in a Scottish Cup final. "Playing Irish League games has been such a help to me - I really appreciate the experiences that I had," Burns continued, ever-grateful for his sound grounding in the local game. "I noticed that last week ahead of the semi-final; having had the experience of playing in big matches, getting in front and killing the game off. "I was also thinking about the day Glenavon got put out of the Irish Cup to lower league opposition, Loughgall. I was mentioning it to one of the other guys in the team before the game on Saturday and how I don't ever want to feel like that again so it was good to use it as motivation." It's been quite a journey in the past 12 months but, as Burns points out himself, it's been almost as big a leap in the past 12 days, since he made his long-awaited return to first team action. Having not played a minute of Scottish Premiership football since the start of December, when his loan spell at Livingston was cut short, there was a welcome return to the pitch at Rangers. And boy did he take his chance. "It was in the lead-up to the game at Ibrox that I was working away in training and then all of a sudden with injuries, I was working it out and thinking I had a chance of being on the bench," he explained, after regular left-back Ben Garuccio suffered a cruciate ligament tear. "Thankfully I got the chance to come on as a substitute. "The manager had played two different guys at left-back in the first two games after Ben's injury but then I got my chance to start in the Edinburgh derby. I was gutted to lose the game but I thought I did ok personally. Thankfully I must have done enough to keep my place in the team for the semi-final. "My mum came over to watch it on Saturday and my agent was there as well so it was really nice to have them there. "I was buzzing just to be starting again. It's been so nice to get into the team after struggling with the groin injury I picked up in December as I was brought back from the loan. That was the first time I'd experienced being out so it was all a learning curve but I'm really appreciating playing now. I had to make sure I worked my way back and got ready to take my chance. "The aim is now to get a run going and make sure I keep that spot until the final. These are the thing you always dreamt about. It's just about kicking on and trying to keep on achieving." With Garuccio expected to be out for 10 months with his significant injury, the left-spot in Craig Levein's side is Burns' to lose with just five games to go until the Scottish Cup final. It's time for his friends back at home to pick a side. St Mirren manager Oran Kearney praised Danny Mullen for his telling contribution as the striker scored against former club Livingston to give his side a precious 3-1 victory.